Several species of Phomopsis (syn. Diaporthe) cause cankers of stems, branches and occasionally the main trunk of trees and shrubs. Due to the many species of Phomopsis present in the region, a wide array of conifers and hardwoods in forest and landscape settings are susceptible to infection. Commonly affected landscape hosts include: rhododendron/azalea (Rhododendron), holly (Ilex), boxwood (Buxus), dogwood (Cornus), Japanese maple (Acer palmatum), cherry (Prunus), spruce (Picea), hemlock (Tsuga) and true fir (Abies). Phomopsis typically becomes established on current year's shoots, or it invades stressed and weakened plant parts through some type of wound (i.e. a canker, pruning wound and insect feeding site). However, Phomopsis can also gain entry through buds and progress down the stem. Primary symptoms of infection include wilting leaves, blight of young shoots, sunken and darkened areas of stems with possible sap or resin flow, cankering on larger stems and branches, browning of the vascular tissue when bark is scraped away, and canopy dieback. However, in many cases there are no symptoms of infection aside from leaf wilting and canopy dieback, making it difficult to identify Phomopsis as the causal agent. Phomopsis will sometimes attack larger branches (>4” in diameter) and the main trunk of shrubs and small trees, but it most often attacks small diameter stems, resulting in sporadic crown dieback. The pathogen is more common on trees and shrubs with thin bark and dense canopies where shade and free moisture linger. Depending on the host and species of Phomopsis present, fruit rot, leaf spots and a foliar blight can also occur. Foliar infections most often take place on broadleaved evergreens, such a rhododendron. Numerous stresses common in landscape settings can facilitate infection, such as transplant shock, physical or mechanical injury, freeze injury, insect feeding and excessive pruning. 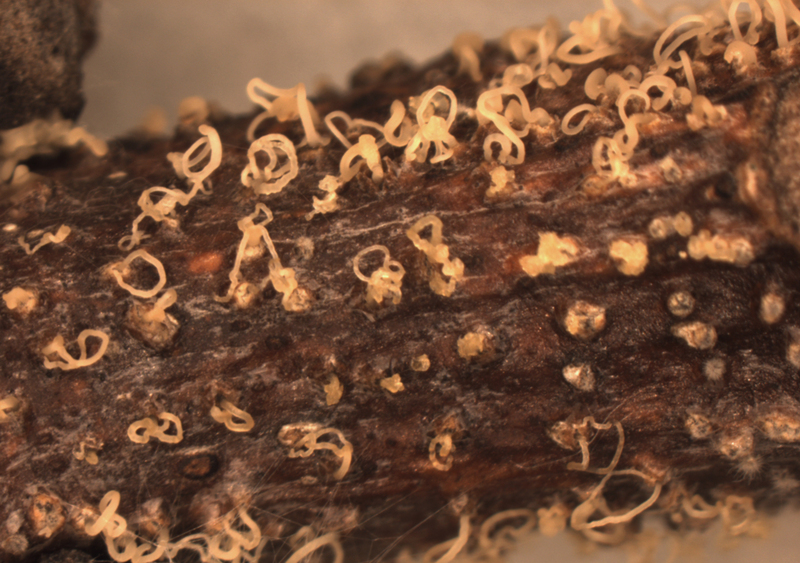 After Phomopsis has established within the host, it produces an abundance of small, black-colored pads of tissue that erupt through the bark to release cream-colored spore tendrils. The spores are washed down or blown onto nearby stems, creating new infection centers. By themselves, the resulting cankers may do little damage but are produced in such large numbers they often girdle stems and branches. Many otherwise healthy woody plants may harbor a minor infection in the canopy that can go undetected until the tree is stressed. Prune and discard all blighted stems and cankered branches from the canopy. For trees with thin bark and dense canopies (e.g. Japanese maple and kousa dogwood), annual sanitation pruning of dead stems, especially on interior canopy branches, can help to avoid disease outbreaks in the future. Avoid pruning during wet weather as this can help spread the pathogen. Sanitize pruning tools after working with plants that are known or suspected of being infected by Phomopsis. The fungus will continue to produce spores throughout the growing season, making it difficult to control once established on a weakened and stressed tree. In certain cases, fungicides can be effective at protecting newly developing plant parts from becoming infected, but often have little curative effect on infected stems and branches. Avoid stresses that make trees and shrub susceptible to infection by opportunistic pathogens like Phomopsis, such as drought stress, insect feeding and excessive pruning. Keep in mind that spores can travel long distances and Phomopsis is very common in the environment, making eradication of the pathogen difficult to impossible.